Surrounded by piles of laundry and bags to still unpack, my exhausted husband turned to me after our first travel experience as new parents and said, “That was NOT a vacation, it was a trip!” With a growing family and these reduced expectations we slogged through the next few years of family travel. But I really did want to take a vacation … as a family … with our children. To go somewhere new together, have fun, see the world through my children’s eyes, experience things as a family in a different way, enjoy each other and build special memories. Eventually, with thoughtfulness, planning and cooperation, we were able to do that many times before they grew up and became their own travelers. Here are some of the strategies that we found helpful. • Have reasonable expectations. This is not a gourmet tour of Parisian eateries; this is family vacation time with emphasis on daytime events, child-friendly activities and eating and family fun. • Know YOUR children and plan a trip that plays to their strengths not their challenges. Does your child like excitement and adventure or is a low-key, relaxing day more her cup of juice? Does he embrace new experiences or hang back from the unfamiliar? Is she an early bird or a night owl? Is he overwhelmed by too much stimulation or energized by activity around him? What makes transitions go more smoothly? How does she react to changes in mealtime and sleep time? Take the temperament and preferences of each of your children into account in planning the whole vacation as well as what you will do from moment to moment. In balancing the needs and interests of each family member, make sure that one child isn’t always expected to accommodate the others. • Involve your children from the get-go as much as possible. Once you have made the non-negotiable parental decisions about the trip (such as budget, destinations, type of trip), then open up the planning discussion, reserving final say for yourselves. Not only will they have greater buy-in, but they may generate some wonderful ideas that you hadn’t thought of. Once on vacation, let each child have opportunities to choose the ride or restaurant, lead the way on a walk, manage their own belongings, or in other ways be in charge or have their say. • Less is more. Do not over-schedule. Plan on a few activities each day and be prepared to alter or ditch the plan as needed. You don’t have to do everything offered or listed in the guidebook. Slow down the pace. Savor each experience instead. And remember that the younger the child, the shorter the attention span and the more time for dawdling, transition and rests needs to be built in to the schedule. • Stick to familiar routines as much as possible, particularly with respect to meals, quiet times and bedtimes. After an exciting day, the nightly bedtime rituals are more important than ever. • Try to have some individual time with each child. This can be a few minutes each day or a longer stretch less often during the trip. The family togetherness is wonderful but children still need some of mommy or daddy to themselves, too. • Decide in advance about which family rules come along and which are left home. Relax ones that are not so important to you. Dirty clothes may still have to go in the laundry bag, but it might be OK to eat breakfast in pajamas or have ice cream an hour before dinner. • Expect the unexpected. Surprises can be wonderful, such as finding out that your picky-eater loves the local cuisine. They can also be unwanted, such as illness or a whole week (your week) of rain. So have backup or contingency plans. When we navigate our way through the unforeseen, we not only have a better time, but we also help build resilience in our children. • Take a partial vacation from electronics. Remember that before the 1990s families traveled without Internet access or gaming devices, and we can still do it—parents and children alike. Dig into some other strategies for coping with long rides or waiting. Talk to each other, look around, play games together, talk to the people you meet, be creative. • Plan for the transition to regular life when you get back home. While there is some relief to sleeping in one’s own bed again, many people also experience a feeling of letdown after a vacation. Try to avoid jumping back into everything all at once as if you never went away. Take some family time to talk about the trip together, sharing photos and memories and solidifying the strengthened bonds you’ve built. 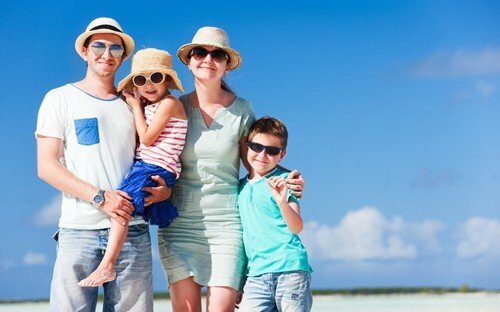 Consider ways to continue in your life at home some of the activities or patterns you discovered on vacation that were meaningful to the family.